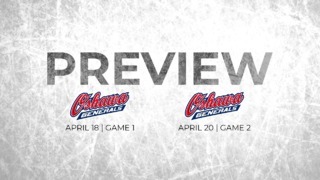 Following a three game road trip last week that earned them five of a possible six points, the Ottawa 67’s will be back on home ice this Friday, October 26th when they host the London Knights. The Sudbury Wolves will also be visiting TD Place on Sunday afternoon, in what will be the 67’s annual Halloween-themed game. The Barber Poles have been rolling lately with eight wins in their last 10 games. Ottawa has picked up points in their past eight games, and have scored 50 goals so far this season. Led by what is proving to be the best line in the OHL, made up of Austrian rookie sensation Marco Rossi and veterans Tye Felhaber and Austen Keating, Ottawa has been terrorizing opposing goalies since the three have been together. Felhaber and Keating are respectively tied for second and third in league scoring with 24 and 23 points, while Rossi leads the league in rookie scoring with 16 points. Goaltender and Orleans native Cedrick Andree is also tied for the league lead in wins. 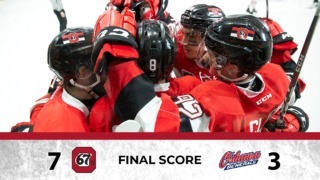 It only took the 67’s 14 games to reach 10 wins. The only team to win 10 faster in recent memory would be the 1998-99 edition of the 67’s who had reached 10 wins in 13 games and then went on to win the Memorial Cup. Ottawa will look to remain on the winning path this upcoming week-end, with two games against tough opponents coming up on home ice. One thing that OHL teams are very thankful for right now is the fact that the London Knights could be a lot better than they are right now. London is currently without Evan Bouchard and at forward Alex Formenton, who are currently seeing time with their respective NHL teams. As if that wasn’t enough, London owns the rights to forward Brady Tkachuk, another name who will probably not be joining the Knights this season. The absence of these players may explain why London isn’t having the start they were hoping for, but this is still a very skilled team, just like the Knights are used to icing year after year. Key players for this edition of the Knights are 2018 top draft picks Adam Boqvist (Chicago, 8th overall) and Liam Foudy (Columbus, 18th overall). Boqvist has adapted well to North America so far, putting up 10 assists in 10 games, while Foudy has eight points in seven game, but he is however currently hurt and may miss Friday’s game. Veteran Forward Cole Tymkin leads the Knights in scoring with 13 points in 11 games. While they may not have exactly found their groove, London looks to be a powerful and competitive team this year, as they always are. One of the early surprises to this start of the OHL season, the Wolves are looking good a dozen games into the campaign. 2018 OHL first overall pick Quinton Byfield has not disappointed thus far with 10 points in 12 games. The rookie forward leads the offensive charge for his team along with 2015 first overall pick David Levin, who has 11 points in 12 games. In nets, Sudbury has their man in Ukko-Pekka Luukkonen. In his first year in North America, the Finnish netminder has a record of 6-2-0, a goals against average of 2.39 and an impressive save percentage of .928, on top of a shutout. After finishing dead last in the OHL last year, Sudbury seems to be taking steps forward and are looking to be a dangerous team night in night out for any opponent. Tye Felhaber is currently on an active streak of 11 consecutive games with at least a point. In those 11 games, Felhaber has combined for 21 points. It took only 14 games for the Barber Poles to get to 10 wins this season. 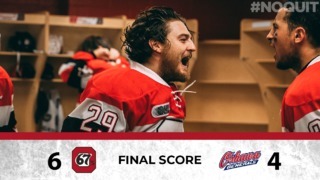 The last 67’s team that was able to do so was the 2011-2012 edition, who counted on players like Tyler Toffoli, Sean Monahan, Cody Ceci and Petr Mrazek. Forward Kody Clark signed his first professional contract earlier this week with the Washington Capitals. Clark has 3 goals and 1 assist this season for the 67’s. Austen Keating leads the OHL in assists with 20. Tye Felhaber has scored the game opening goal 7 times this season, a league best. Lucas Peric has already doubled his season total from last year. He has put up a goal and 5 assists in 14 games this year. Last season. Peric had 3 points in 57 games.